Today marks the 40th anniversary of the Supreme Court's Roe v. Wade decision. Since that day, generations of Americans have been lost to abortion. The number of lives cut short? 55,000,000. In order to recognize the anniversary, The Susan B. Anthony list has released a powerful video featuring prominent pro-life leaders and abortion survivors to "reclaim the human center of the abortion debate." The entire thing is worth your time. Although today marks a dark day in history, there is hope for the future. The youth in the pro-choice movement are unmotivated while the majority of the country is pro-life and many believe abortion should be severely regulated if not banned in most cases. Gallup began asking Americans to define themselves as pro-choice or pro-life on abortion in 1995, and since then, identification with the labels has shifted from a wide lead for the pro-choice position in the mid-1990s, to a generally narrower lead for "pro-choice" -- from 1998 through 2008 -- to a close division between the two positions since 2009. 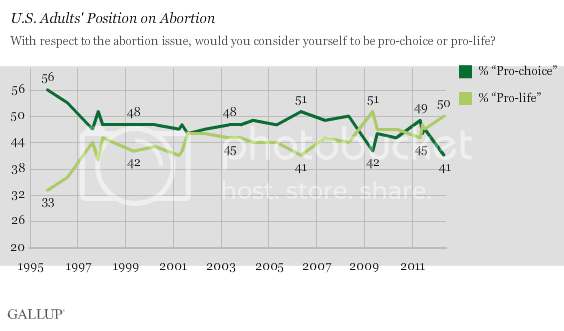 However, in the last period, Gallup has found the pro-life position significantly ahead on two occasions, once in May 2009 and again today. It remains to be seen whether the pro-life spike found this month proves temporary, as it did in 2009, or is sustained for some period. The decline in Americans' self-identification as "pro-choice" is seen across the three U.S. political groups. Since 2001, the majority of Republicans have consistently taken the pro-life position, but by a gradually increasing margin over "pro-choice." That gap expanded further this year, with the percentage of Republicans identifying as pro-life increasing to 72% from 68% last May, and those identifying as pro-choice dropping to 22% from 28%. Still, Republicans' current views are similar to those found in 2009. On Friday January 25, thousands of people will participate in the March For Life in Washington D.C.
Now more than ever, the American people do not embrace the legacy of Roe v. Wade, with its 55 million victims. Pro-life is the "new normal", and states are enacting record numbers of pro-life laws. At this important moment in our nation's history, please join us for the 40th anniversary of the MARCH FOR LIFE with the hope that soon we will work ourselves out of a job.